That is correct, but everything in the car is depending on the wiring and electronics. To validate our designs we need proper data analysis (all sensors are connected with a wiring harness). Our paddleshift system needs a wiring harness to control all components. Bad wiring will cause malfunctions which are very hard to track down. Producing professional motorsport wiring harnesses is a very time consuming job and you need to be very skilled/experienced. When building a new car, my advice is to outsource the job to a professional company. If you need to make modifications on existing harnesses, the following tips could help avoid those nasty wiring issues. 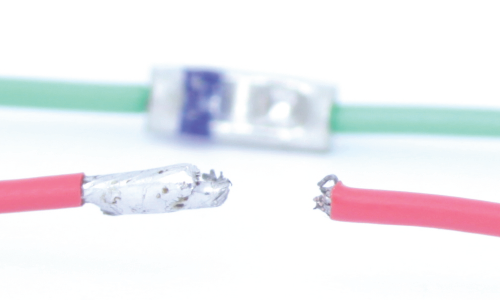 Tip #1: Try to avoid soldering, use splices! From my experience, most malfunctions come from wires which have been soldered (improperly). My advice is to NEVER solder wires unless there is really no other option. And if you need to solder, use proper material. 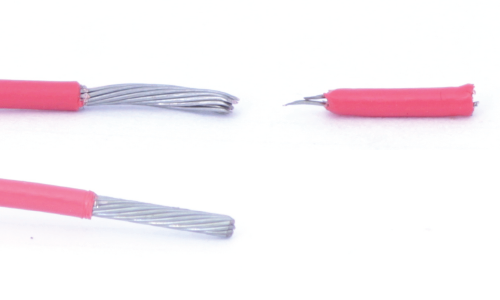 The solder joint itself is strong, but the wire will break directly after the joint when vibration is applied on the wire. 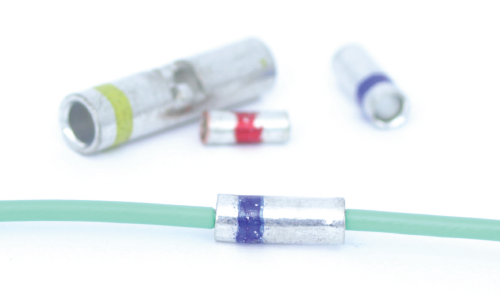 Therefore, if you need to solder wires, make sure they are properly fixed (for example with glued heat shrink or acid free RTV Silicone).There are a lot of different splices available. 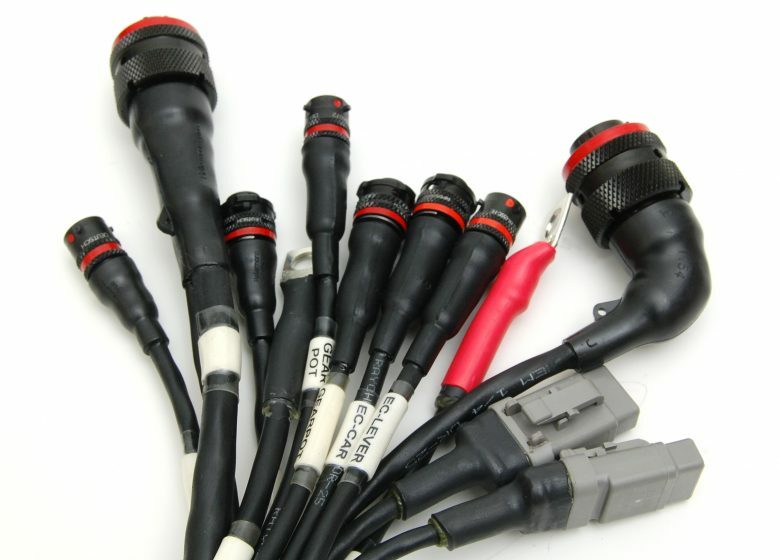 We use D200 Miniseal splices (MIL-Spec M81824) for most of our applications (using Daniels GTM232 crimp tool). – How many contacts do I need? – How many mating cycles will be needed? – How many amp will go through a contact? – Which temperature will it reach? – Will there be moisture/water/chemicals around the connector? *IP68 – Protected from total dust ingress. Protected from water to depth more than 1 meter. *IP69K – Protected from total dust ingress. Protected from steam-jet cleaning. 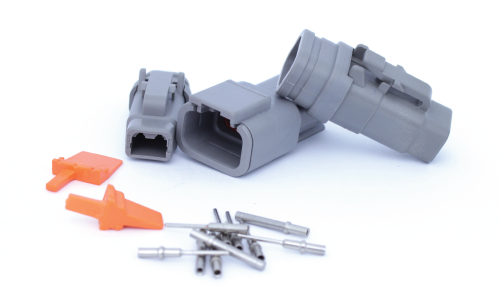 For example: A gearbox sensor connector will probably get in contact with water and oil. The temperature can exceed 125 Degree C and will have more than 10 mating cycles. The right choice would be a Deutsch DTM or higher spec connector. Always use wire strippers that only cut the insulation, not the wire itself. You will need to know the wire diameter, and set the stripper accordingly. Always perform a check if no cores are cut during stripping. I’m not saying you need to wire your car like a space shuttle, but using some of their techniques wouldn’t harm you, right? 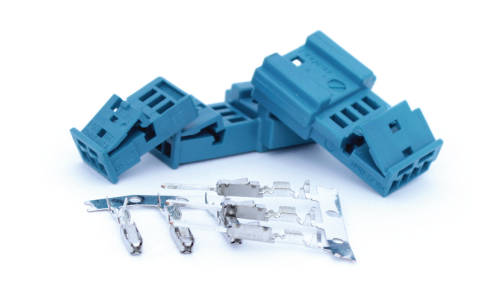 Which type of wire and sleeving should be used, is depending on the purpose and budget. 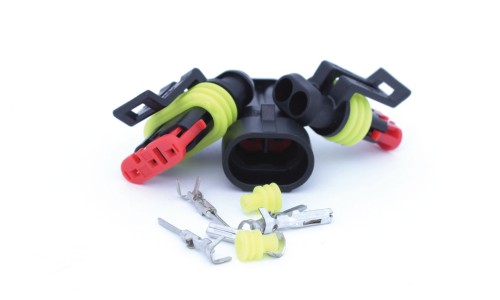 For our wiring harnesses we use Raychem Spec 55A (M22759) wires, DR-25 sleeving and moulded boots. It might be overkill in some applications, but we do not want to be the weakest link in the chain. 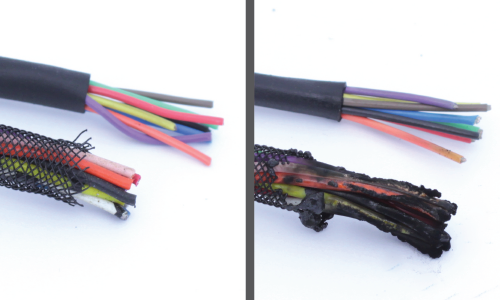 A very noticeable difference is flammability of wire insulation and sleeving. Both cables are 5 seconds exposed to a 300 °C heatgun. The bottom cables are melted together and creating shortcut, the spec55A wires are still functioning. When you’re facing wiring issues, it is searching for a needle in a haystack if nothing is labelled or no diagrams are available. Doing a quick fix at the track and not updating the diagrams will cause messy documentation and it will take you forever to track down issues. Making quick fixes and not labeling cables/wires will double the work next time there is an error. Use a label writer (e.g. 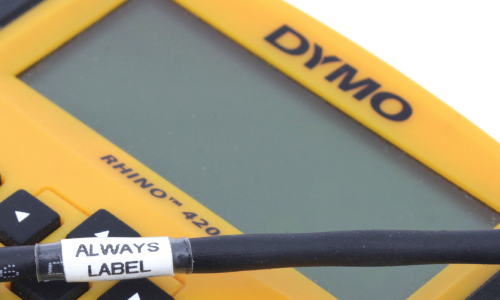 Rhino 4200) and clear heat shrink for durable labels. We all have made once a connection and were not 100% sure if it was a solid connection, but due to time or skills we just let it be. It was working for now, right? Next time if you’re not 100% about the connection, do it over again. And again. Until you are fully confident it will not fail and not ruin your race. So you will need to spend roughly €1500-€2000 on tooling as a bare minimum. You also need some basic supplies such as contacts, sleeving and wires (€200-€800 ). It seems a big amount in total, but I believe it will pay off if it will avoid wiring issues and DNF results. Thank you for reading this blog. If you would like to get more blogs on this subject, please share or comment below!